NASA’s newest exoplanet-hunting spacecraft has started taking scientific data as of last week, according to a NASA release. TESS, the Transiting Exoplanet Survey Satellite, is a two-year-long mission tasked with surveying the skies for planets around other stars. After launching this past April and delivering an incredible first image of the sky, the real hunt has begun. 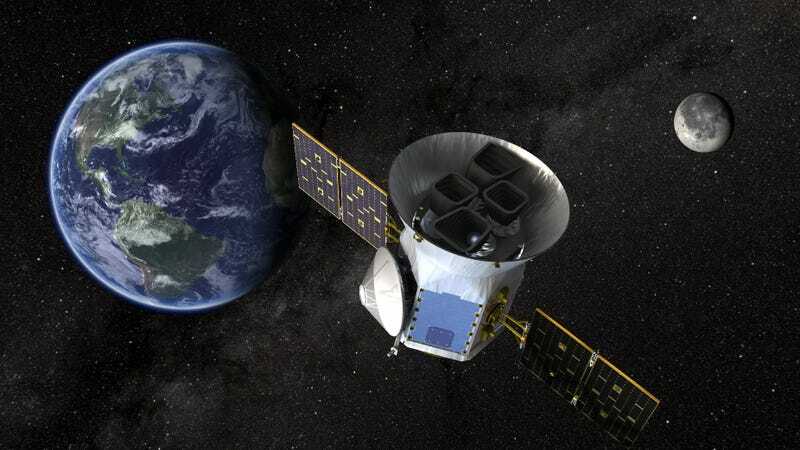 Earth-orbiting TESS will use its instruments to measure 200,000 stars within 300 light-years of our Sun. It can peep more and brighter stars than its predecessor, Kepler and K2 (two missions, one spacecraft). It will also be better at imaging exoplanets orbiting in the habitable zones of red dwarf stars like TRAPPIST-1 and nearby Proxima Centauri. Some scientists have speculated that those strange worlds could be home to extraterrestrial life. The spacecraft’s four 16.9-megapixel CCD cameras each image an area of the sky about the size of an average constellation, according to the NASA release—the schedule is here. TESS will monitor each region for 27 days, then move on to the next, ultimately mapping 85 percent of the sky—that’s 350 times more sky than Kepler observed. The first data will come in August, and then every subsequent 13.5 days (every orbit). TESS is mainly a survey mission. It will create a catalog of nearby stars whose light dims periodically, signaling the presence of an orbiting planet. These stars will be candidates for follow-up observations by other telescopes, which will be able to determine their masses and other properties, like the compositions of their atmospheres. The upcoming James Webb Space Telescope will begin to study these exoplanets. Life-hunting scientists are more interested in finding potential biosignatures, characteristic light emissions from molecules that could be indicative of life—things like organic compounds and water. We’ll likely have to wait until the 2040s, when a future telescope will have the capabilities to make observations like those. Finding a habitable exoplanet will be a long process, but it’s a process that’s now in full swing, thanks to TESS.